The last appointment that I had at Selly Oak (next post will be about my appointments so far, the whole point in this blog… bear with me!) was to give me a new hearing aid. The idea at the moment, is that as my last hearing aid was ancient (which is anything over 5 years in hearing-aid-land) and coming up to the grand old age of about 7 years old it was high time I had a new one as it may or may not take me out of the criteria threshold for the CI in which case means that a CI can be “saved” for later and I’d tootle on with the new all singing and dancing hearing aid for the time being. A lot of hearing people that I have met throughout my life have always been confused with the idea that I have been able to hear music (I used to play the clarinet and the piano for example) or hear an aeroplane go by. If I have told them I am deaf, they assume I cannot hear anything at all. And I don’t go anywhere without it. It’s a perception that quite a few strangers, or people I meet for the first time that haven’t come across many deaf people before cannot get their head around and I do totally get why actually. Most understand straight away where I am coming from once I’ve explained. So the idea of a hearing aid, is that it aids a deaf or hard of hearing person to pick up more sound than they would normally. It doesn’t make us hearing, and it doesn’t stop us from being deaf (as of course, the second the hearing aid comes out of the ear, we go back to complete silence again). A hearing aid means that sound is amplified to such a great heights that we can pick something up. Therefore we can play music on a stereo and hear noises to some extent. Vibrations also help us when identifying what sounds there are around and this also assists in what we can hear. Amplification normally occurs when using a hearing aid but the amplification of sound doesn’t necessarily make everything clear by default, the sound is still artificial in a way and sometimes it’s very hard to differentiate between sounds in a noisy environment. Hence why lip-reading is still essential, and subtitles on the television are still a must. I can get by just about out and about without my hearing aid, but I much prefer having some sound to assist the lip-reading. Another thing that a lot of people don’t understand until I explain is why some loud noises hurt my ears and make my eyes “wobble”. Surely if I am deaf, loud noises shouldn’t hurt my head more than a hearing person’s? I remember asking my Mum this question some years back and her answer made complete perfect sense. One of those moments when you think “Of COURSE! Doh!” Basically as most of you will know, sound is made of physical sound waves. These waves enter your ears and the louder the sound, the more waves your ears have to take. If you add a hearing aid on top of that, amplifying everything further, your ears are taking the normal sound waves (that my ears cannot process and hear) PLUS the extra waves on top. Ouch muchly! So there has it! Hearing aids are not for every deaf person though, some don’t get on with them at all, some prefer the silence as the mumble and distortion that comes with hearing aids for lots of deaf people can be too hard to adapt to and some simply cannot find a hearing aid that is powerful enough. I have always worn them though, considering myself fortunate to be in a position where they can benefit me and would never be without one. That’s why, as I am struggling more and more to cope with just having only one ear now that a hearing aid can do something with, a CI is the route I am hoping to take. I’ve become rather fond of my hearing aids over the years, they have been a lifeline for me. 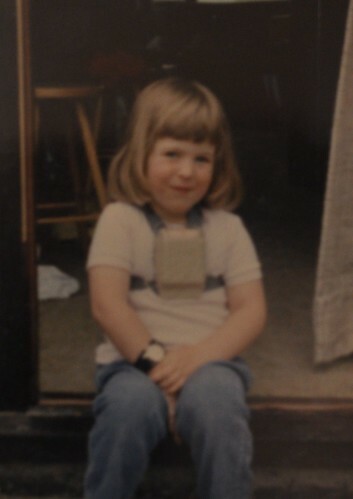 The very first hearing aids that I was fitted with when I was a mere 2.5 years old were in the form of two little white boxes, one for each ear and they sat in straps on my chest with leads up to the earmoulds that sat in my ears. My Mum used to make pockets to sew onto my dresses and sometimes even made the dresses herself so the boxes could sit nicely within my clothing, rather than wear straps. She used to choose dresses with large sleeves or collars so the straps didn’t rub against my neck. I didn’t wear these hearing aids for long though as when I was 3, along came the famous Phonic Ear, otherwise known as the Radio Aid. The Radio Aids deserves capital letters, they were HUGE and to this day are rather infamous! A Radio Aid consisted of one big beige box that sat in place of where the two little white boxes used to be on your chest and boy was it heavy! The Radio Aid meant that key people in your life could then wear a microphone which was a suspicious long thin beige necklace type thing and it became all I ever knew Mum wear! The microphone had a long tail (which was the ariel) and “eyes” which were actually the chips. A chip identified the frequency between one Radio Aid and it’s microphone. If you were in an environment where there was more than one person with a Radio Aid, listening to separate people with microphones, you needed to make sure that you only heard “your” microphone and not someone else’s! There were times of course, when several Radio Aid users would be listening to one person. In these cases rather than the speaker wear several microphones (now there’s a look!) all the Radio Aids could all have the same chip and bingo, we were all tuned into the same mike. This program was taken through right into the boxes that were compatibles with post aurals too – so in the 80’s they got it right sometimes! Nowadays, it’s all done by loop system. Anyway, I mention post aurals, they were the BIG thing that came out of hearing aid development. Hearing aids that were powerful enough yet small enough to it behind one’s ear. Amazing! How the shoulders of all Deaf people across the land sighed in relief. Phew. 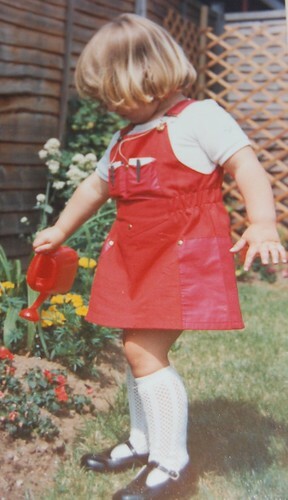 Those Phonic Ears were big burdens to carry, and were awkward to put on and taken off too (especially on 3 year olds!). I got my post aurals when I was 5 years old, the story of when I got them I mentioned in my first blog post. However since writing that post, I’ve learnt a lovely story in that my post aurals were actually rushed through so I had them in time to be a bridesmaid! How fab is that, I got to wear lovely discreet hearing aids and my lovely (peach, how so 80’s!) bridesmaid dress was shown in all it’s glory. I had no idea this happened until Mum told me the other day, I wonder if equivalent privileges are still awarded today? I hope so. Little things go a long way sometimes. Along with the post aurals, came a new kind of Radio Aid that was optional and an accessory. The leads from the box which I wore on a belt (no pinafore for me!) had a “shoe” on the end, which clicked into the bottom of my hearing aid and was used at school in class or assembly. These “shoes” were fragile things. As I found out, they did not take to being stood on very well! I have many fond memories of primary school where my teacher would disappear from class for a few minutes, but often would forget to turn her microphone off. My hearing friends would gather around me with their ears pressed against mine and giggled along with me as we heard water flushing as said teacher had obviously nipped to the loo which unfortunately was still within radio range! Oh dear. The post aurals were analogue, back in the day. I remember they were very basic but did the job. Although most people have gone digital now, many Deaf people are still loyal to the beauty of analogue. It still amazes me now though, just how advanced technology can get. For years I used to walk to town in the rain, with my hearing aid in my pocket as water and hearing aids did not mix. The hearing aid that I’ve just been given is waterproof, whoo hoo! It’s not built to withstand water to the depths that I could go swimming with it (awww) but at least getting caught out in the rain no longer is a worry. They also come in all kinds of colours now, how exciting is that! For years and years, they were always a boring beige colour, although some people were lucky and had the choice between beige and dark brown. A memory that my Mum recently reminded me of, is that the Radio Aid for the post aurals I had in primary school came in brown at first (no surprises there) but I didn’t mind as it matched my Brownie uniform… until I started at Guides when I was 10… so imagine my delight when I heard that there was a new colour out? Yes! You guessed it… Blue!! The earmoulds were next, we could get red or green or blue earmoulds and I imagine they were brilliant for little children, creating a novelty when persuading them to wear these new awkward things. But I was never that bothered, until the glittery ones came out! And now, you can get digital hearing aids in all kinds of colours. If I get to the point of choosing the CI I want, I will also get to choose the colour too, shall I go for purple? Pink? Perhaps they come in transparent… now that would be interesting! My hearing aids have had their fair share of trials over the years, belonging to me has never been an easy ride poor things. There was the time when I dropped one down the toilet, the hearing aid repairer at school was not impressed with having to handle that one when I explained what had happened to it. There have been near misses with sand, water (a plenty) and once I had children, for some reason hearing aids have equal appeal if not more to glasses for those little baby hands… luckily they’re very robust things. So I finally get to the stage where I explain about my last appointment at Selly Oak, (well done for getting this far) where I was given a new hearing aid. The last one has been broken for over a year and a half and unfortunately my local audiology department had never been able to find a suitable replacement (that’s a whole new story for another blog post, maybe). My last hearing aid was the first digital aid that I ever had, it was amazing, I adored it. Digital is the way to go in my honest opinion, it was programmed specifically to the type of hearing loss I have and so emphasised on high frequencies (that I can hear less of) and not so much on low frequencies (which I hear more of). It was able to pick out what I needed to hear more of in a noisy environment, so in a pub for example, I could hear more of the voices closer to me rather than the general hubbub. But alas, they don’t make that make of hearing aid anymore. There are bigger and better hearing aids now and I was well overdue an upgrade. Problem is, I’m a hard lady to get it right for. I had an appointment with a lovely lady who I felt at ease with straight away. She obviously knew what she was doing, she was obviously a very experienced Hearing Specialist. I liked her immediately and this is always a good start. She was well prepared, explained everything before we started and I walked away feeling very positive. The hearing aid she gave me needed a bit of tweaking whilst I was there, and I’ve got to give it a try for 3 weeks. It is going to sound different, my head needs to learn how to adjust to the sounds that this aid is now able to provide for me that I couldn’t hear before. It’s also LOUD without hurting my hears which is fantastic, I can hear things I couldn’t before. I am finding it very hard to get used to it though. At the time of writing this, it has been 5 days and I am still struggling in noisy environments. I went to Asda earlier and I couldn’t make out what the cashier was saying as everything was loud and completely drowned out her voice so I had to rely on lipreading only. The increase in volume is wonderful, although it means that my head has been overloaded with constant sounds which has taken some getting used to. Whereas before, my living room once the girls were in bed was completely quiet, (ahh, peace) I can now make out a contant whooshing whirring sound which I’ve been informed is the digital television box and quite frankly, it’s getting on my nerves! To the outside person, the increase in volume may sound just the thing I needed, but there is a lot more to that when finding a new hearing aid to suit you. With this one, the quality of sound is very important as well as the quantity. I can’t remember if I’ve explained why I only wear a hearing aid in one ear despite having a profound loss in both – quality not quantity is exactly the case there too. With the new hearing aid, everyone sounds nasal, like they have a cold. There is also a “ssss” sound on the end of everything which is driving me mad. And of course there’s still the problem of picking out sounds to focus on in noisy environments. I will be relaying all these concerns back when I go back in a couple of weeks. It could be that the hearing aid just isn’t going to improve things enough or it could be that some frequencies still need to be altered, or perhaps by the time the appointment comes round, I’ll have got used to it and my brain has learnt how to handle all these extra sounds I can hear. Ultimately though, no matter how good the hearing aid is in my right ear, I still want a CI in my left. I long for hearing in both ears again and the hearing I do get from my Right with the help of a hearing aid, even a fabby one really isn’t good enough for me to cope like I used to anymore. I have never had a problem with the fact I am deaf, if anything I love the Deaf community it means I am a part of, I have always maintained that being Deaf is a way of life not a downside. But if there is any way that life can be made easier for me, then I’m going to take it. Before I go, here’s a few photographs to share. 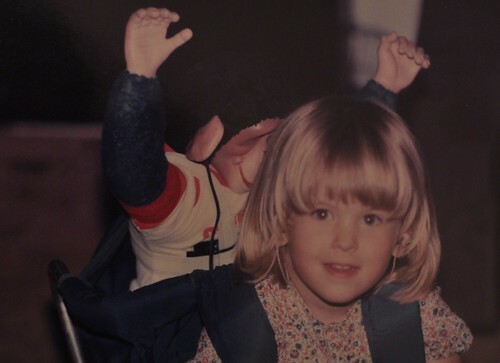 The first is of me aged 3, with the very first hearing aids that I had and Mum will correct me if I’m wrong, but I think it’s a dress she made so the pockets for the aids were part of the dress. Wasn’t she fab? And look at the size of that Radio Aid! Apologies for quality of photos. I’ll scan the originals one day and post them instead, photos of photos (especially ones already in an album) are never going to be sharp. Next blog post, hopefully will fill you in on the other CI appointments I’ve had so far. Watch this space! 4 Responses for "So… that bit of technology behind my ear…"
Fab photos! I loved my first digital aid (Phonak) but hate my current aids (Oticon). They are very different. Oticon are supposed to give me clarity but they don’t give me the volume that Phonak did. Progress, eh?